Food Adventures of a Comfort Cook: Meatloaf Again...Stuff It! 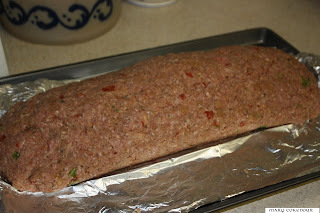 So there I was, staring at the package of ground beef and wondering, "what do I serve with the meatloaf this time?" There was the leftover macaroni and cheese; wow, how original, can you tell I just wasn't feeling it? I'm not really sure how it happened, but sometime during the ingredient gathering process, this idea popped into my head and wouldn't let go. 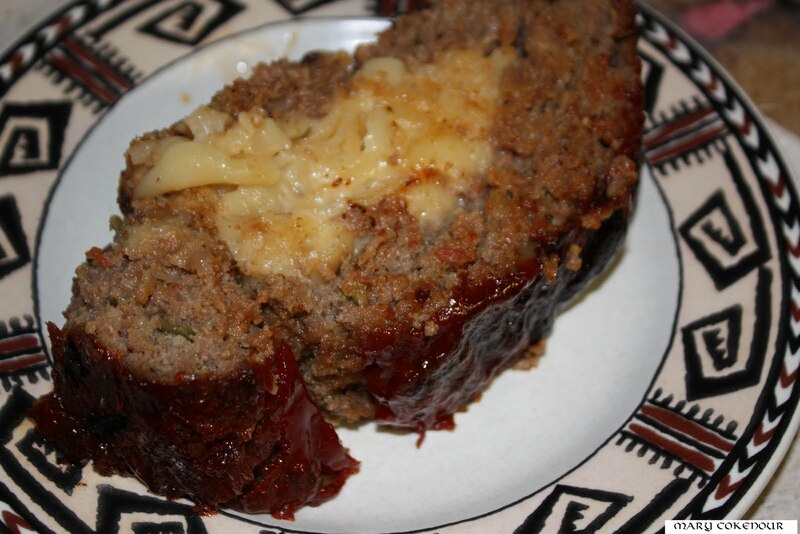 What if I wrapped the meatloaf around the mac n' cheese? 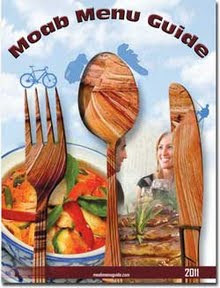 Could I even achieve such a thing; what the heck would it look like; more importantly, what would it taste like??? Ok, call me crazy, but I just had to try it, just to see if I could do it mostly. I took photos of the process to go along with the recipe. The aroma in the kitchen was awesome, but the taste of the final product was out of this world. Now I can't wait to try out other types of fillings, but don't worry Roy, I will make my regular meatloaf from time to time as I know how much you like the original. Trial and error...who would have thunk it? Preheat oven to 375F; line a 4 qt baking dish with aluminum foil and spray foil with nonstick cooking spray. Line a large jelly roll pan with parchment paper, wax paper or aluminum foil. In a large mixing bowl, mix together all ingredients except the macaroni and cheese and the ketchup. Invert bowl over center of jelly roll pan and deposit mixture onto it. Flatten mixture out to edges of pan. 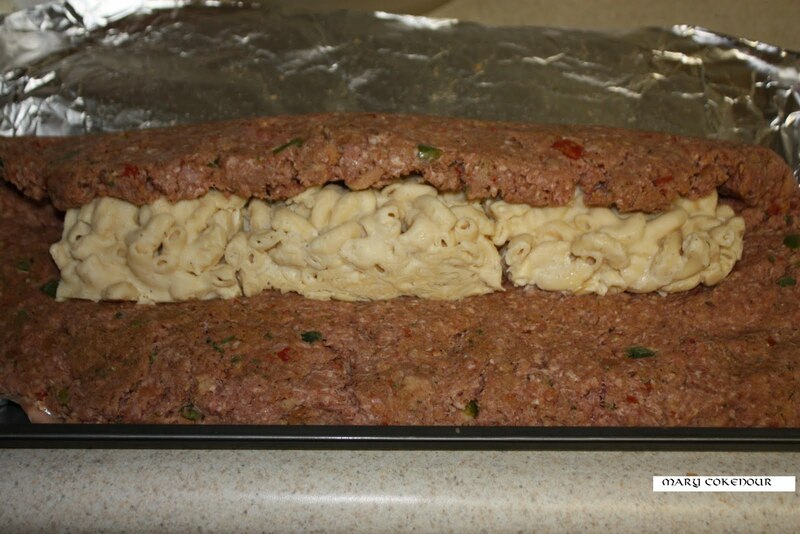 Cut macaroni and cheese into 3 sections and line up edge to edge down lengthwise center of flattened meatloaf mixture. Put hands under lining and carefully lift mixture over filling, press down firmly and carefully peal back lining; repeat with other long side. 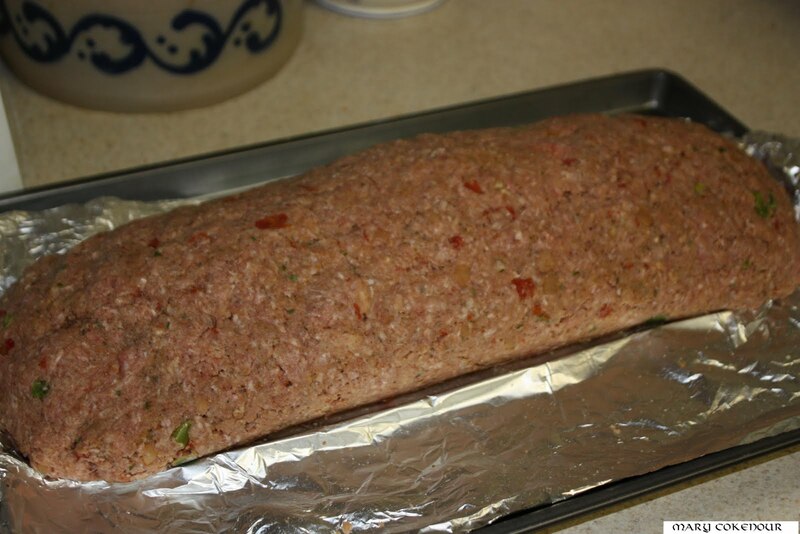 Seal the seam over the filling and the sides of the meatloaf; smooth the meatloaf mixture over to create a firm seal. 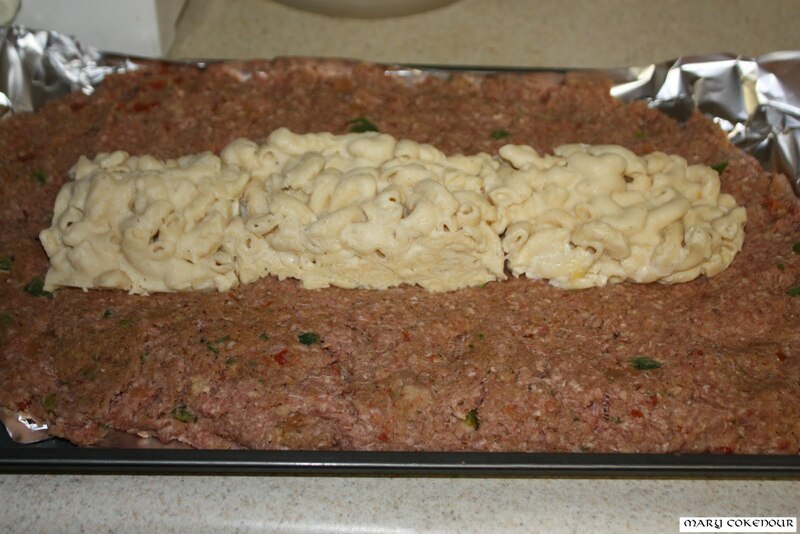 Turn the baking dish over the meatloaf; with one hand hold down the baking dish while lifting the jelly roll pan with the other hand; flip over and let the meatloaf drop into the baking dish. 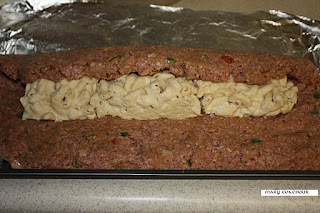 Remove the lining off the meatloaf; make sure to position the meatloaf down the center of the baking dish; smooth over any cracks that may have opened. 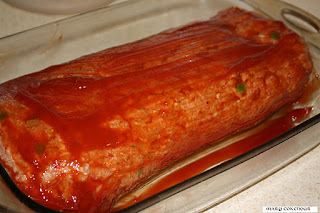 Brush ketchup over top and sides of meatloaf to create the glaze. Place baking dish on center rack of oven and bake for one hour; brush a second layer of ketchup over the top and sides and bake for one additional hour. 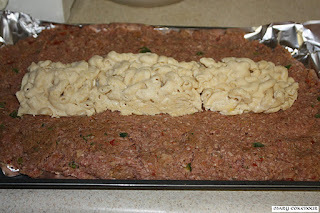 The meatloaf will be too large to remove from the baking dish, so cut slices and use a narrow spatula to remove to a plate. Makes 12-14 servings depending on how large the slices are cut.